Togher originally lay in the parish of St. Finbarr’s South until 1890, when it formed part of the newly created parish of St. Finbarr’s West, better known as The Lough Parish. People has to travel considerable distances to attend religious services; Mass, Baptisms, Funerals etc. In 1963, Dean Murphy, P.P. 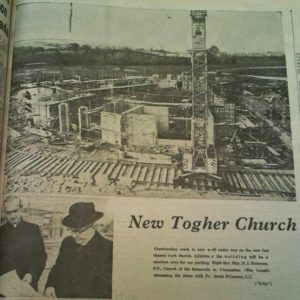 of the Lough Parish, observing the huge development in the area and anticipating even greater changes, began looking for a suitable site for a new church in the Togher area. It was at this stage that Fr. Craven, the Provincial of the SMA, offered the Dean a five acre site on the Togher road. This site, forming part of the SMA site in the Doughcloyne area was transferred to the parish, free of charge, for the future church in 1966.
collection was organised. These ventures raised over £15,00. In the meantime, Fr. O Connor said Mass in St. Finbarr’s H&F Club until the church was built. Work on the church began in November 1970 with Messers. O Shea, of White Street, as the main contractors and Mr. Boyd Barrett as the architect. The total cost of the construction would be £129,154. The church is fan shaped, 110 ft in front tapering to 103 ft. at the back, where the altar stands. The height of the building is 36ft. And the altar raised to give the whole congregation good view of it. It has a capacity of 1,200. As well as the main entrance door, there is one side door. The church originally had four confessionals, and a small mortuary chapel to the right as one enters the church. An 85ft. high spire, faced with natural limestone, dominates the entrance to the church. The outside walls are faced with reconstructed stone. The foundation stone was laid and blessed by the late Bishop Cornelius Lucy on July 29th. 1971. The actual opening ceremony was performed exactly one year later on July 29th. 1972. This ceremony was conducted by Bishop Cornelius Lucy, assisted by the late Fr. Michael Murphy and Fr. Denis O Connor.